A former researcher at Duke University has admitted to faking data that allegedly were used to secure hundreds of millions of dollars in federal grants. Duke has also admitted that it knew Erin Potts-Kant, a pulmonary scientist, faked data, but it’s unclear whether that was discovered prior to using those data to apply for grants, as a lawsuit alleges. The admissions come from court documents submitted by Potts-Kant, her supervisor — former Duke researcher William Michael Foster — and Duke itself, responding to allegations in a whistleblower suit that says they defrauded the government. Regular readers may recall that Joseph Thomas, a former colleague of Potts-Kant and Foster, has filed a False Claims Act suit against the three defendants on behalf of the U.S. government. The responses, submitted separately by the three defendants, are the latest development in what could be a landmark case for research misconduct. The lawsuit has survived motions to dismiss and is moving through the discovery process, which is likely to reveal more than the defendants have already said. to the extent she altered experiment data, she knew the altered experiment data was false. In addition, Duke has admitted that it found out about the fraud when Potts-Kant told an investigative committee about it. 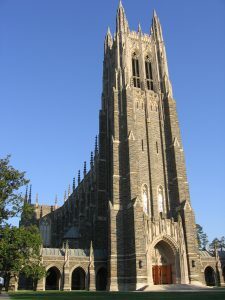 The pulmonary division launched an investigation in 2013 after discovering the embezzlement and Duke launched a formal scientific misconduct investigation in June 2013. An admission that there’s falsity of data in the context of research misconduct doesn’t in and of itself create False Claims Act liability. As we reported in last year in an article for Science, Duke began investigating Potts-Kant’s work after it discovered in 2013 she had embezzled more than $25,000 from the institution. According to the lawsuit, the investigation allegedly found that she’d contaminated almost every project she touched with fabricated or altered data. She’s racked up 16 retractions since then; Foster, who has since retired from Duke, was a senior author on many of those papers. The duo’s problems — and Duke’s — intensified when Thomas filed suit under the False Claims Act, alleging that Foster and the university had used Potts-Kant’s fraudulent data to apply for 60 federal grants worth approximately $200 million. This type of whistleblower lawsuit allows individuals witnessing fraud against the U.S. government to recover damages on its behalf. Successful whistleblowers receive a portion of the recovered funds. The institution’s response was filled with some version of this refrain: that Duke admits Potts-Kant told its ad hoc investigation committee that, while she was employed there, she fabricated or falsified data that made their way into publications and grant applications. In at least one case, they added that she acknowledged this amounted to research misconduct. In “Mast cell TNF receptors regulate responses to Mycoplasma pneumoniae in surfactant protein A (SP-A)-/- mice,” Duke said Potts-Kant “fabricated flexiVent data in Figure 6a.” That paper was corrected in November 2015. Duke also admitted that at least one grant application included figures that could have been affected by Potts-Kant’s misconduct. Whether the plaintiffs can prove Potts-Kant, Foster, or Duke knew the false data were going to be used in a funded grant application — and that the data were actually important to getting the grant approved — is key. that during the time period relevant to the allegations… he was involved in operating a laboratory for research at Duke University and researchers at other institutions. Except as expressly admitted, Foster denies the allegations. If he can show he had no responsibility of oversight or knowledge of Potts-Kant’s activities, It could limit his exposure. We reached out to attorney John Thomas of Roanoke, Virginia firm Gentry Locke, which is representing his brother, whistleblower Joseph Thomas, but he told Retraction Watch he was not in a position to comment at this time. We are not able to provide further comment at this time. It looks like this could be a non-false False Claims Act suit.